An upper level disturbance will bring one more day with scattered showers and thunderstorms in the forecast. As we move into astronomical summer, temperatures will seemingly increase on cue. Wednesday’s forecast panned out well with 40 percent of the forecast area receiving rain, primarily north of I-10. Today and Tonight: Just enough tropical moisture is left that a storm system clipping our area could produce scattered showers and thunderstorms on Thursday. This, and not daytime heating, will be the trigger for activity so afternoon will not necessarily be the prime time as usual. The best chances for showers and thunderstorms will be along and north of I-10 from mid-morning to mid-afternoon. Highs will be in the low 90s with lows in the mid 70s. Summer began at 5:07am on Thursday. In south Louisiana, heat and steam kick in well before the astronomical calendar says it should, but even in the Deep South, higher heat has become a trend. 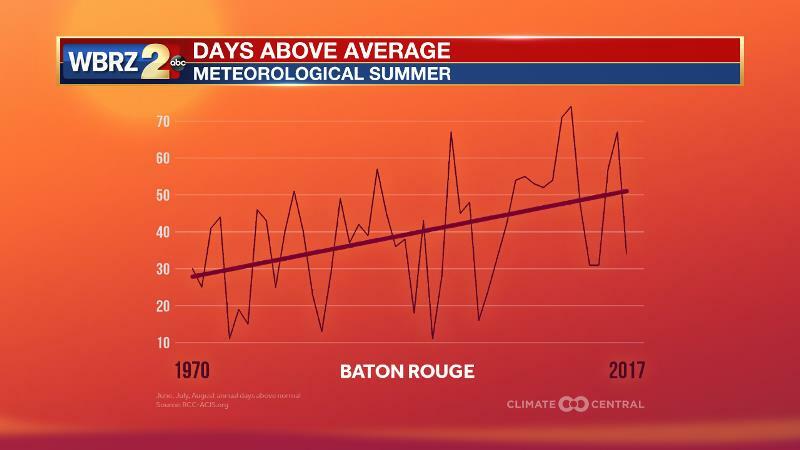 Over the last 40 years, Baton Rouge has found many more above average temperatures during the summer months. Obviously some summers come in with more, others with less, by the trend line shows a steady increase toward hotter. Up Next: Friday will be a transitional day with decreasing rain chances and seasonably warm temperatures. For the first weekend of summer, warmer and drier upper levels will start to cut down on rain chances. As a result, additional sunshine will guide and hold highs in the low 90s. Continued humidity will create “feels-like” temperatures in the low 100s during the afternoons. A pop-up or too could be around, but that is about it. A 500mb trough cutting through the nation’s midsection will bring one more day of increased rain chances. This trough will tap into remnant Gulf moisture and trigger showers and thunderstorms as the associated energy passes over the area. This energy will mean that daytime heating will not necessarily be needed to generate activity. Rain chances will increase away from the coast northward. Friday, the trough will stay sit north of the area but the area of positive vorticity advection will be east and deep moisture will continue to decline, hence lower rain coverage. A 500mb ridge will nudge into the area from the east into the weekend. This ridge will bring drier and warmer air aloft therefore decreasing rain chances. This will mean more sunshine and warmer high temperatures with numbers topping out in the low 90s. Meanwhile, surface dew points will stay high and heat indices will reach the low 100s during the afternoon hours. As it is summer, rain chances cannot be entirely eliminated from the forecast but showers and thunderstorms will be sparse through Tuesday.